This agreement will govern the terms and conditions of your enrollment. Please review all information for accuracy as there will be no modifications, alterations or addendums without the express written consent of the enrollment department. Course length: twelve (12) weeks with Stan Freifeld for a total of either a) 18 hours for the Complete Progam or b) 9 hours for Level 1 & Level 2 Programs. Student shall receive either a) two (2) sessions weekly for the Complete Program or b) one (1) session weekly for Level 1 & 2 Programs of personal telephonic consultation. Duration of sessions approximately (45) minutes. 1. It is understood that the McMillan Mentoring Program is for educational & training purposes only. Investment in the Futures & Equities markets hold inherent risk & potential for loss of investment. No guarantees of profit in the trading in these markets are expressed or implied. 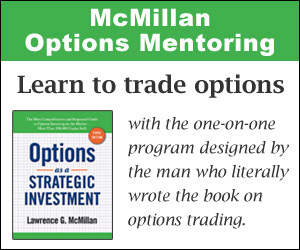 It is understood that the student will be responsible for their own trading and investing decisions and that MAC (McMillan Analysis Corporation) will not in any way, shape, or form manage, direct, trade or control clients funds or trading. McMillan Mentoring is not liable for any profits or losses that occur in client’s account as a result of the educational process. The educational materials presented in this course are proprietary and timely. Student will have ten days (10)from beginning of contract before terms of contract are finalized. Should either student or MAC determine that course is not appropriate, student and/or MAC reserve the right to cancel. In the event of timely cancellation student will receive 100% refund of all tuition. Student must make request in writing, U.S. registered Mail. Request must be postmarked with-in ten days of beginning of contract. NO Refunds will be issued after that date. Client will be charged retail value of any bonus items that have been delivered before cancellation. McMillan Mentoring program is billed by McMillan Analysis. If you have paid by credit card your credit card billing statement will reflect a charge by McMillan Analysis.